Verizon wireless is one of best wireless phone mostly used because of its strong reliable network and better plans of mobile device users. Verizon is introducing new Skype instant messaging application with through which one can put the world in his or her pocket. Through Skype mobile application users can make unlimited Skype to Skype calls and IM with anyone any where in the world. One can send unlimited messages any where in the world. Verizon Skype Mobile application is automatically available on the following mobile devices but certain devices have to download this cool and amazing application to run on them. 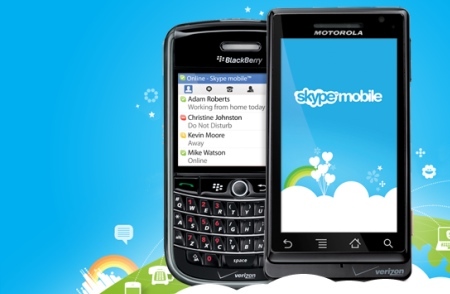 Mobile devices which include Skype Mobile applications are black berry storm, black berry curve, droid Eris by HTC, Motorola Devour, Droid by Motorola etc. Verizon Skype Mobile messaging application is really astonishing and mind bellowing innovation for the users. Through this application users can communicate each other with very low and minimum cost. It reduces l internationally call rates at a very low cost. Through this software, one can transfer data with a very high speed from one location to another.